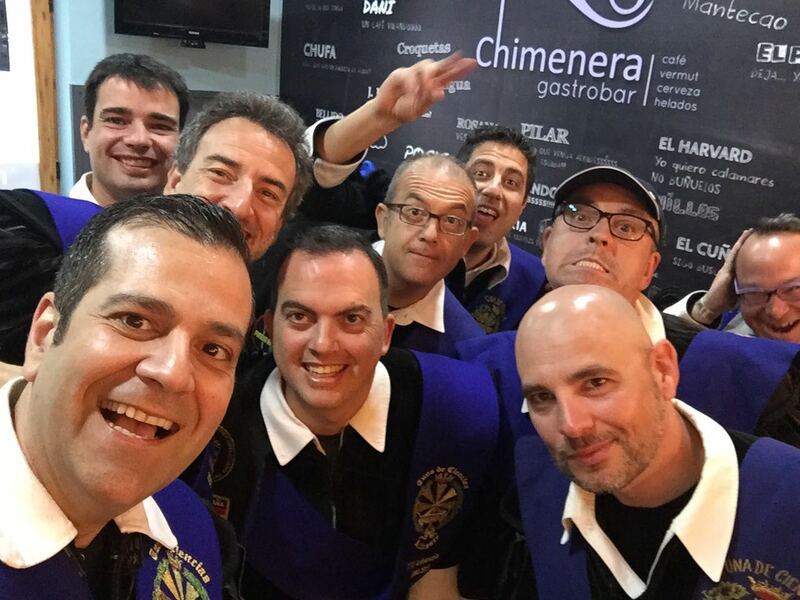 Website maintained by Carlos "lechon" and José Antonio "Terelu"
This past weekend have participated in the I Contest of Tunas Provincial of Mutxamel, organised by the Tuna Feminine of Right of Alicante. We have happened it very well, and besides we have carried us some prizes, among others the one of pasacalles and round to the Virgin of Loreto. We leave you the audio of the Round to the Virgin in the section "Sound". Full stop because May presents loaded of evento. We see us prompt! 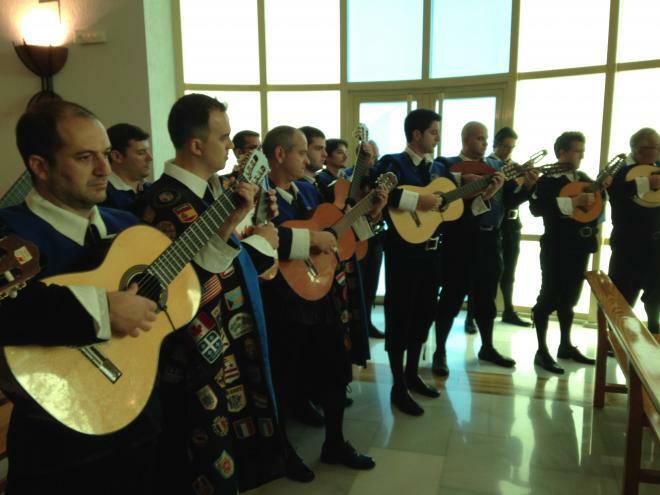 The past day 30 December finish the year with a very special performance in the Cottolengo of Saint Vicente of the Raspeig. It has been a big pleasure for us carry the music of the Tuna to this small and at the same time Big Family that form so much the patients like the Sisters Servidoras of Jesús of the Cottolengo of the Cheerful Father. Happy year to all! This week have eaten of Christmas in Alicante. We see us by there!!! In veranito follow surrounded of good friends, and if it is with music, better! We follow singing in summer!!! This weekend have given by finalised the acts conmmemorativos of the XXV Anniversary of the Tuna of Sciences of Alicante. We want to appreciate to all the world that of one or another form has participated with us in this so special evento for us: familiar, tunas participants, public, technicians of sound, City council of Saint Vicente of the Raspeig and in particular to the Concejalía of Culture and media (Periodic "The Raspeig", Saint Radius Vicente 95.2 FM and Television of Saint Vicente). A lot of THANK YOU!!!. Stand out that they have collected something more than 300 Kg of foods no perishable for Cáritas. And everything thanks to you. Satisfied have material of the evento, will go it publishing. Already they have given beginning the essays of the performance of 9 January in which we are preparing a musical repertoire that collects our essence. For the moment time of essay and reunion with lso old friends. 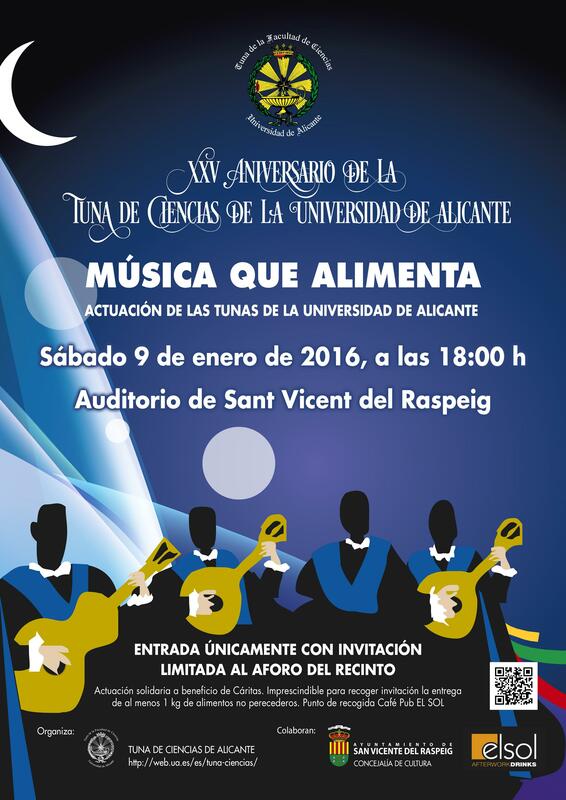 With reason of the XXV Anniversary of the creation of the Tuna of Sciences of Alicante, goes to realise a special evento of commemoration. It goes to be a day completito since have programmed food, performance and dinner. 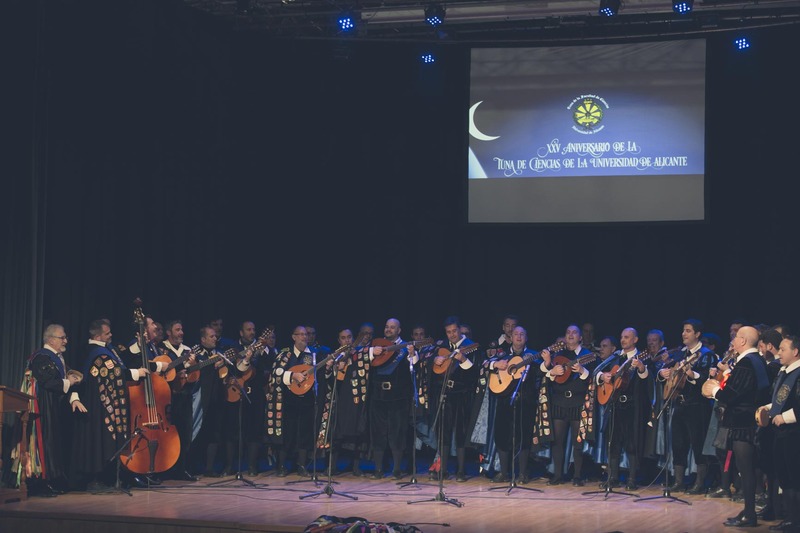 The central act will be a performance in the auditorium of Saint Vicente of the Raspeig at 18:00h, in which they are invited to participate all the tunas of the city of Alicante. It is an act of character solidario in which, as in previous occasions, the entrance achieves by means of invitation that obtains delivering at least a kilo of foods no perishable to profit of Cáritas. It is important to stand out that the entrance to the auditorium only can effect with invitation, and will be limited to the aforo of the same (roughly 330 people). 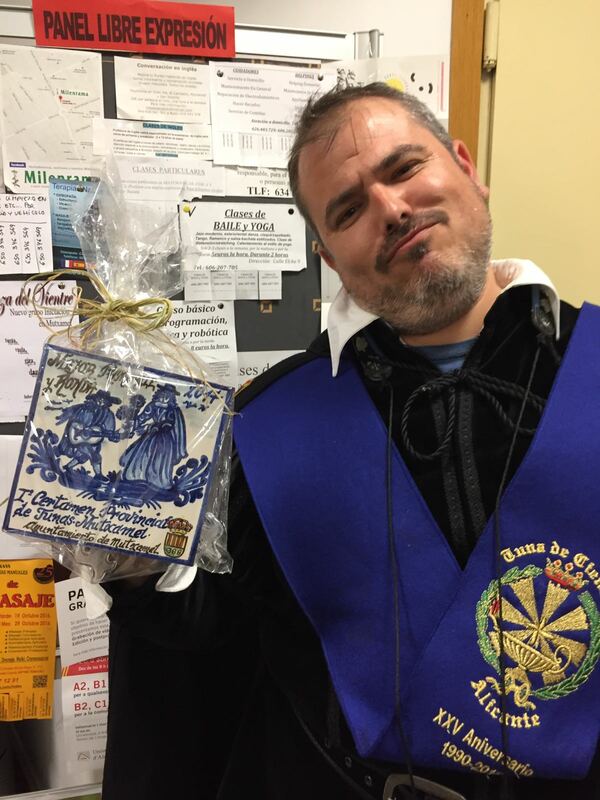 The point of collected of foods and delivery of invitations is the coffee pub The Sun of Saint Vicente of the Raspeig (for which no it conozcais, is situated in the square of the Iglesía and ancient City council). Nevertheless, podeis put you in contact with us if had some problem in this sense. And little more. We will go you informing of the details of the performance by this half so that esteis to the day of the novelties. Appreciate to the City council of Saint Vicente of the Raspeig, and especially to the Concejalía of Culture, the involucración in this project and the eases that are giving us so that in so short space of time do reality. From here, thank you very much!!! We leave you the poster of the performance designed by ours illustrate "Lapicito" (Enrique) so that him echeis a glimpse. A greeting! The holiday season and the end of this year 2015 fast approaching. Although there are still by tying many fringes, on the occasion of the 25 anniversary of the Tuna of Sciences of Alicante are preparing a special performance for the 9 of January of solidarity character. Soon we will inform you. Meanwhile, we leave a couple of pictures of the dinner of twinning which took place on November 20 in Alicante with the University Tuna of Almeria. 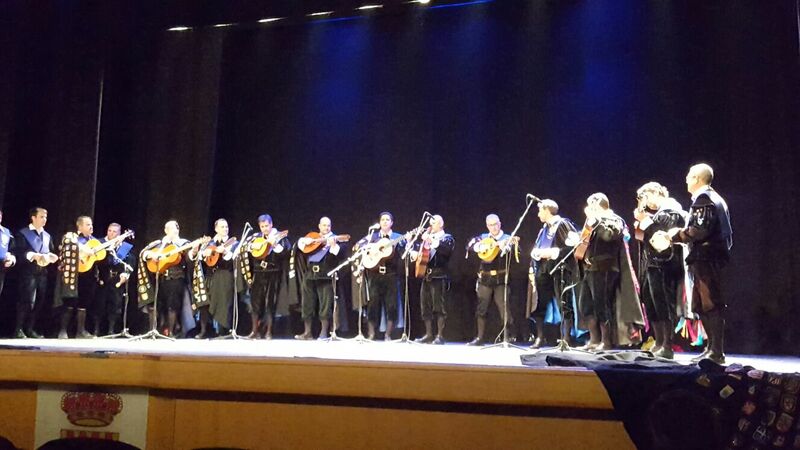 We finally have the recording of the performance made by our Tuna in the contest "Ciudad de Almería" in November 2013. We leave link so that you can enjoy live at one of the last performances of the Tuna of Sciences of Alicante. Well Yes, but with the caloret, we are still singing in summer. This time in the wedding of the sister of one of our members. That don't stop the music! "Salamanca vuelve a convertirse en punto neurálgico de la tradición estudiantil de la tuna. La Tuna de Medicina con motivo de su vigésimo aniversario de refundación, ha convocado este fin de semana a varias tunas de distintos puntos de España. 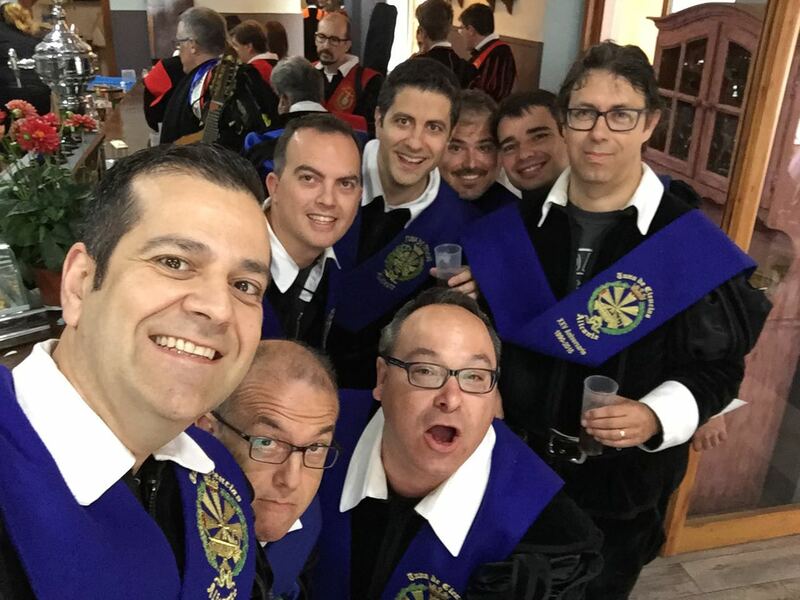 Las agrupaciones de Distrito de la Laguna (Tenerife), de ciencias de Granada, de Ciencias de Alicante, la Universidad de Almería, de León y la Tuna de la UNED de Úbeda (Jaén) han llegado este viernes a Salamanca y se han hecho notar por el centro de la ciudad con motivo del cuarto certamen de tunas Ciudad de Salamacna. Desde las 19:30 horas ha tenido lugar un pasacalles que ha partido con media hora de retraso desde la Plaza Mayor y que con una hora y media de duración aterrizaría en el Patio de Escuelas. 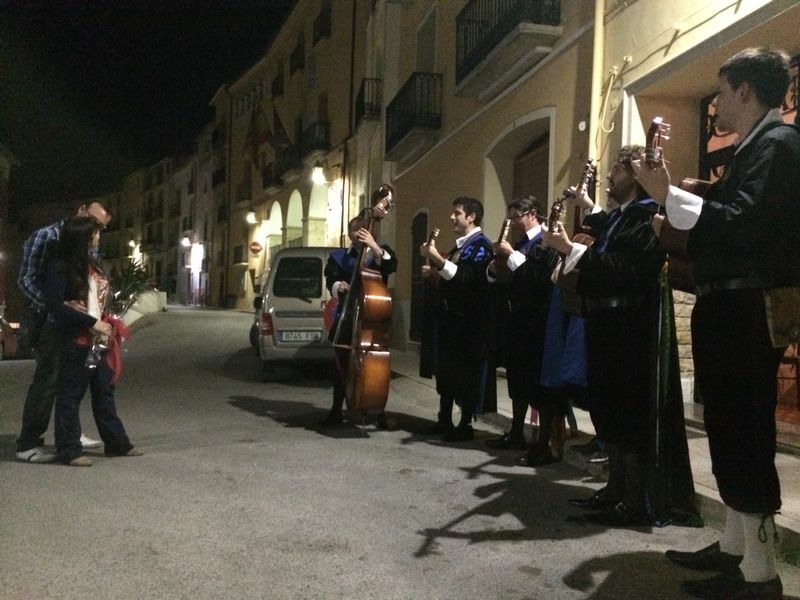 El desfile de tunos concluyó con la tradicional ronda a la madrina del certamen, la ex concejal Plar Fernández Labrador, en el balcón del Teatro Liceo. Este sábado tendrá lugar en el teatro Juan del Enzina el tradicional concurso a partir de las 17:30 horas, en un acto especial por el vigésimo aniversario de la Tuna de Medicina de la Universidad de Salamanca." Looking for a Tuna in Alicante or surrounding area for a special event? Do not hesitate, call us. You can find our phones on the 'Contact' section and follow us on various social networks. By the way, we have confirmed our participation in the contest of Tunas in Valladolid, on 9 and 10 May. OS adjuntamo poster. I stay tuned! Here below some pictures of our last performances. This time we move to plans and had great. We are also finalizing our participation in the fair of Valladolid tunas. We will inform you. 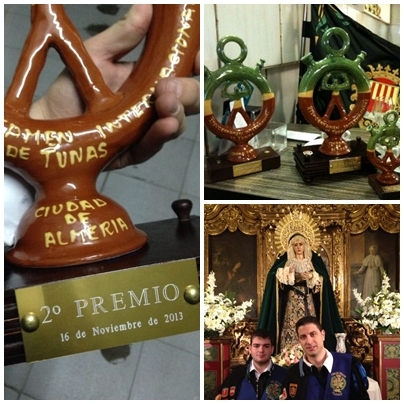 In the 14th national contest of "City of Almeria" Tunas, tunas participants (including the Tuna of Sciences of Alicante) made a floral offering to the Virgin of love and the Esperanza de la Cofradía de Estudiantes. They sing the 'Silence' of Rafael Hernández bolero. You can find the link for this event in the sound section. To see if we are with a complete performance in brief. The object of all Tunas competition enjoy a weekend of TUNA (with capital letters) beyond where they organize, and if possible, win the largest number of possible prizes in different categories. This weekend we have had the luck to share this unique moment accompanied by our great friends and organizers of the University Tuna of Almeria, where the Tuna of Sciences of Alicante has obtained the 2nd best Tuna of the competition and best parade awards. Highlight the great performance also from our friends at the Tuna of Sciences of Granada award to the best Tuna. Our congratulations and a hug for them. We leave some of those moments with nostalgia for the time enjoyed, and look at our next meeting, the Christmas dinner. It is possible that the performance, recorded entirely, may be soon available on youtube, so we will inform you with the news in this regard. However, remember that you can consult these and other information via Facebook and Twitter. 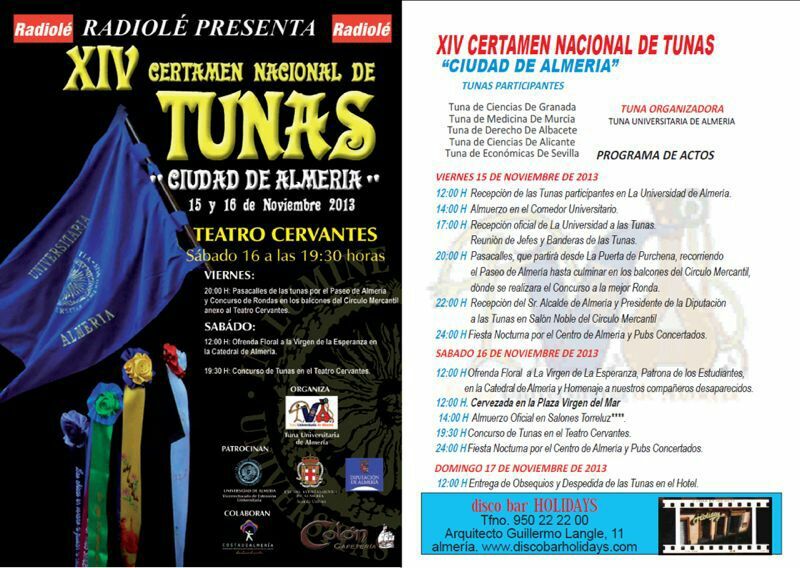 The Tuna of Sciences of Alicante participates next November 16 tunas contest "City of Almeria", one of the most interesting Spain tunas in terms of musical level competitions. Aunque en la página de la Tuna de Ciencias de Alicante siempre somos optimistas, hoy es un día triste porque ha fallecido una persona muy especial para nosotros. Una persona que siempre tenía una sonrisa para nosotros, nos ayudó, nos dió de comer y de beber, y sus palabras fueron guía en el desarrollo de nuestra actividad. Nuestra Madrina Ari. Querida y respetada por todos nosotros. DEP. Nuestro más sincero pésame a su familia. La palabra "embarque" es ampliamente conocida dentro de la jerga de las Tunas (entre otras muchas). En general, consiste en un acto típico en el que suele actuar la tuna (como por ejemplo bodas, bautizos, etc,etc...) pero con la peculiaridad de que en este acto intervienen familiares o allegados directos de algún tuno, por lo que este tuno en cuestión solicita o "embarca" a sus compañeros para que vayan a cantar gratis a su evento. El sábado pasado asistimos al embarque de uno de nuestros tunos, donde previamente nos reunimos para comer, beber y por supuesto cantar, antes de actuar en el interior de la Iglesia de San Juan. 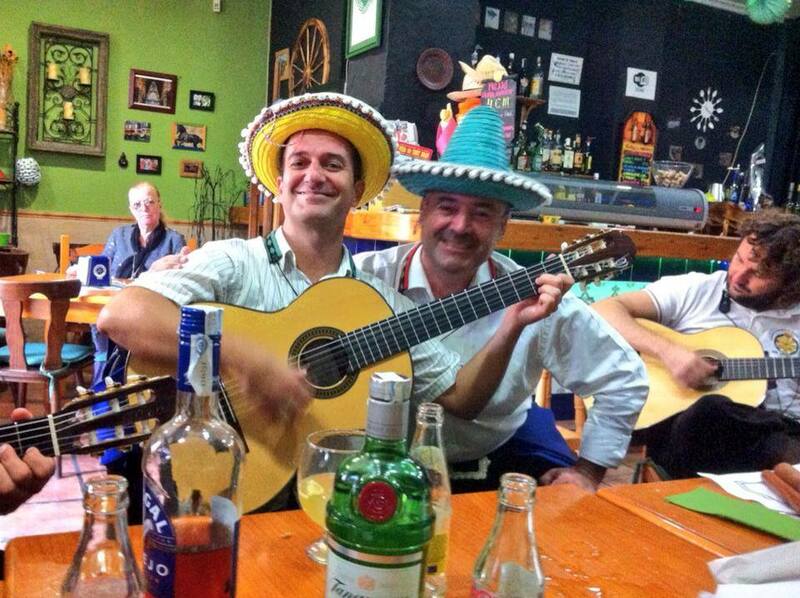 La canción que solemos cantar en estas ocasiones es un Ave Maria pero no el convencional que tocan coros rocieros, sino el "Ave Maria Nomorro". Aquí os dejamos algunas fotos de ese momento y de lo bien que lo pasamos. If you're in Orihuela Costa and you feel like listening to the Tuna of Sciences free and live, don't hesitate to stop by Villamartin Plaza. We will act on June 27 from 20 hours. Ya sabemos que Mayo y Junio son meses de bodas, bautizos y comuniones por excelencia. No obstante, en estos dias a algunos de nuestros miembros les ha tocado (y les tocará) pasar por vicaría. 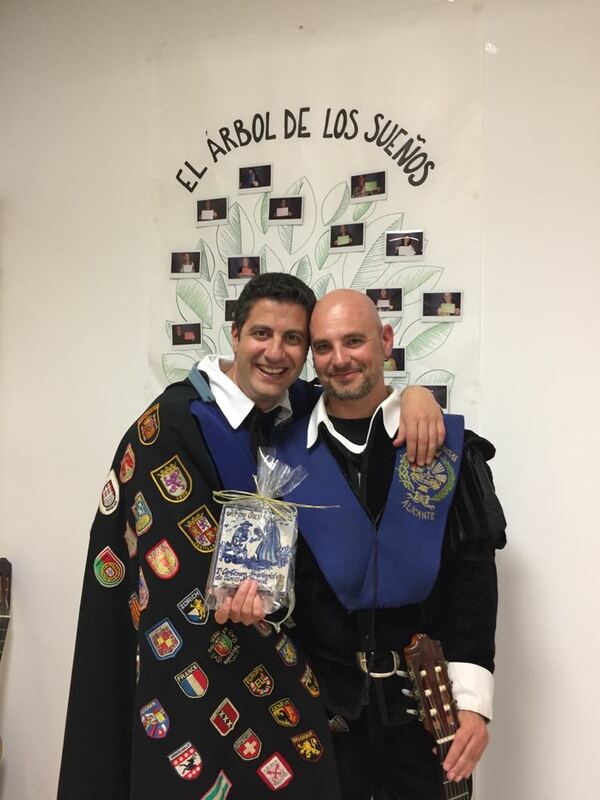 Nuestras felicitaciones a Sergio y Quique por sus enlaces!. 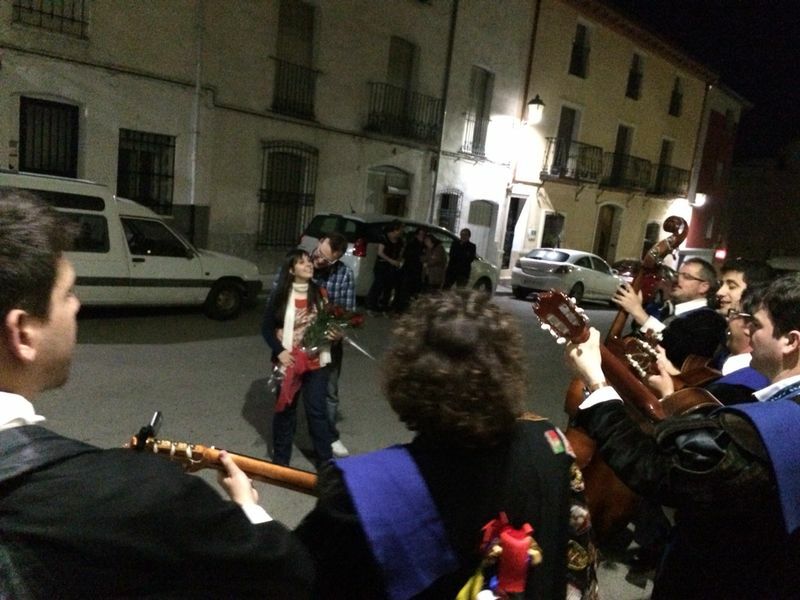 La semana que viene intentaremos poner algunas fotos y videos de la serenata. Finally the IV contest of Tunas city of Alicante, we can conclude that it has been a "huge success". More than 800 people, as shown in the picture, attended the performances of the different formations University who took part in the event, from Salamanca, Almería, Murcia and Valencia, as well as the host the Tuna of Sciences of Alicante. The program picked up as the parade of Friday 19 at the Casa de la Festa and mentioned actions outstanding, on Saturday 20, in the Auditorium of ADDA. 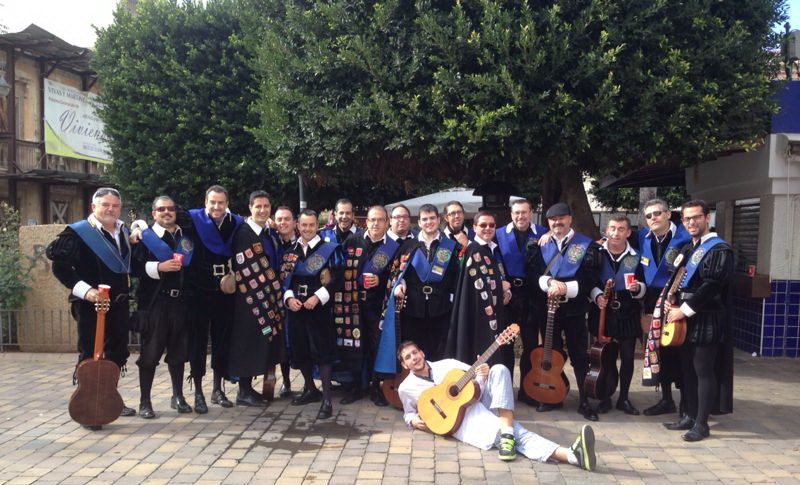 In total, more than 150 Tunos were enjoying, singing and having fun through the streets of the city of Alicante. After the positive atmosphere of the close of this meeting, the next contest, which would be the fifth, already provided the intervention of tunas from Central and South America, as they have extended invitations to tunas of Lima and the Autonomous University of Mexico. The Tuna of Sciences thanks to all attendees, more than 800 delivery food, recoiendo 950 kilos, which were delivered to the Food Bank Foundation for solidarity assistance. As you can see, the site of the Tuna of Sciences of Alicante is in full renovation. Little by little we will be hanging new content, songs, pictures, videos, etc. If you have any request in particular, as always, do not hesitate to get in contact with us. 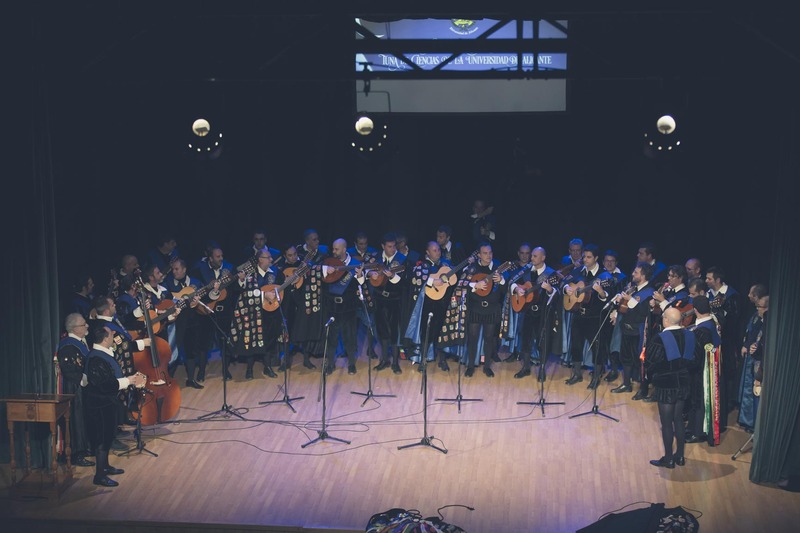 The international contest of Tunas city of Alicante will reach this Fourth Edition with historical passed year after year, having achieved the maximum capacity of 1,200 attendees of the previous edition in the newly opened ADDA (Auditorium of the provincial Council of Alicante) as a venue for the main Act. The support of public and private institutions again fundamental to develop a popular Act of Cultural character directed, not only to the student population, but also to the citizens in general. Informing and trying to be of interest to the people of Alicante in the way and customs of this tradition of almost eight centuries of existence. Through music, instilling the University spirit in our province, and get promoting our city as a point of reference in the realization of this type of event. The past contest had impact in different media appearing in the newspapers: information, Las Provincias y La Verdad, on several local Television channels, and live on Channel 9 and radio stations; both national as the Valencian Community. Currently, and after just three editions has consolidated as one of the most important University Tunas at the national level. 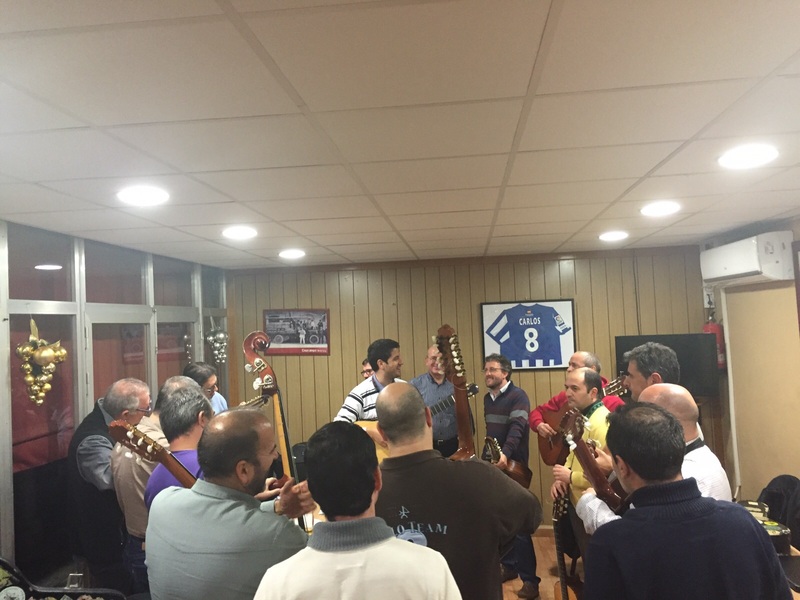 The event was always held with a marked social character, and in previous editions has raised funds for associations such as the Food Bank Foundation of Alicante, as well as adoration, dedicated to helping women at risk of exclusion. This year we are going to collaborate with the Food Bank Foundation of Alicante, and to the entry you will need to bring 1 kg of non-perishable food, so our goal is to collect "one ton of food"